I love camping here. It's right off Lake Erie so the kids can just walk to the beach. I just wish it had mature trees. We have a great family time and enjoy a lot at the beach area. The environment was awesome and staff was good. We came back here after 2 years and found the park even more special after having been in lots of parks since. The beach was clean, the paved sites make it easy to set up, each site has lots of green around it, and having Lake Erie right at your doorstep is very special. We biked into Monroe and stopped at the River Raisin Battlefield, a National Park Service site, the Labor Museum, and the Monroe History Museum (who knew that Custer came from Monroe, MI?). If you don't like to bike, there is a lovely walk around the wetlands, an area that was full of egrets when we were there. It is about 40 miles south of Detroit's center, so we took advantage of the Detroit museums, too. While it is easy to access from the interstate, you don't hear traffic. Great park! This campground is very basic. The roads in/out are solid surface and easy to navigate. The campsites are adequate along with the hook ups. It was very windy at the sites closest to Lake Erie and the beaches were dirty, littered with debris, trash and dead fish. Unfortunately we happened to visit the area when the mayflies were swarming. We were looking forward to seeing Lake Erie and I'm sorry to say I was very disappointed with this campground. We chose this park because of its location on the shores of Lake Erie. It didn't disappoint. In addition to its great location, it has very good facilities. The showers are separate rooms, tiled, very nice. Not many trees, which was fine in September but might matter more in the summer. Nice flat sites. Nice playground. We stopped in here as we wanted a waterfront view for the evening. The friendly staff was able to get us a great site with a great view. There is a selection of back in sites and pull thrus, and all seemed to have ample space around them. There is however no shade at any of the sites. 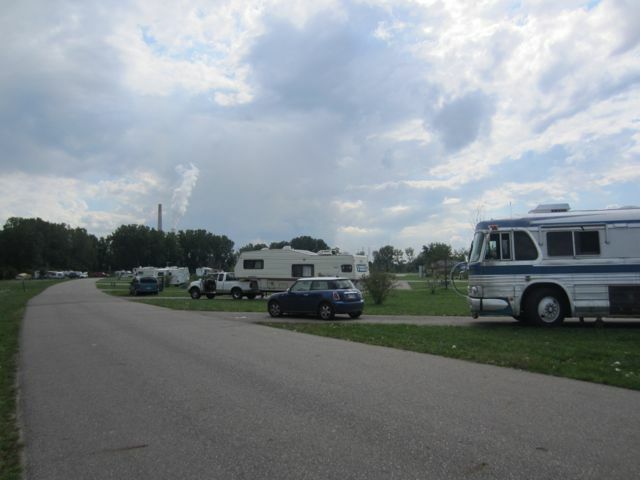 The views of Lake Erie are gorgeous, and the beach in front of the campground quite nice. Not sure we'd swim there tho, the water had an interesting green glow to it! The park is surrounded by power plans on both sides giving it an interesting industrial feel. We did set off for a walk around the park, the paths here are quite great! We managed a 7 mile walk. The loop around the lagoon quite pretty, even with an overlook tower. Overall, a perfect stop for the evening - and we had usable AT&T and Verizon 3G signal. We had a great time at Sterling, the beach was well groomed and the camp ground and shower/ restrooms were clean.